Bhutto's glamorous looks and her sense of style, and her trademark (Hermes) white scarf, had made her a political diva, fashion icon, and; a media darling in the West. The Oxford and Harvard educated former Pakistan premier was once on People magazine's "50 most beautiful people list." Beautiful and Charismatic. 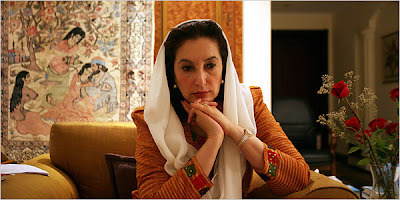 Bhutto at the age of 35 became the first woman Premier and youngest person to head the government of a Muslim-majority state in modern times.